This summer has been full of surprises with its twists and turns; all while being simultaneously consistent and monotonous. Its incongruence and break-neck pace has set me off balance a little, so this blog had to take a back seat for the past several weeks. Thank you for being here again and it’s good to be back to creating in this food world of mine. These past couple of months have been spent living between Kansas City and staying out-of-town. Living out of a suitcase is exciting at first, but gets old quickly. As an introvert, my home is my sanctuary and it feels so good to back home cooking and baking in my own kitchen again. 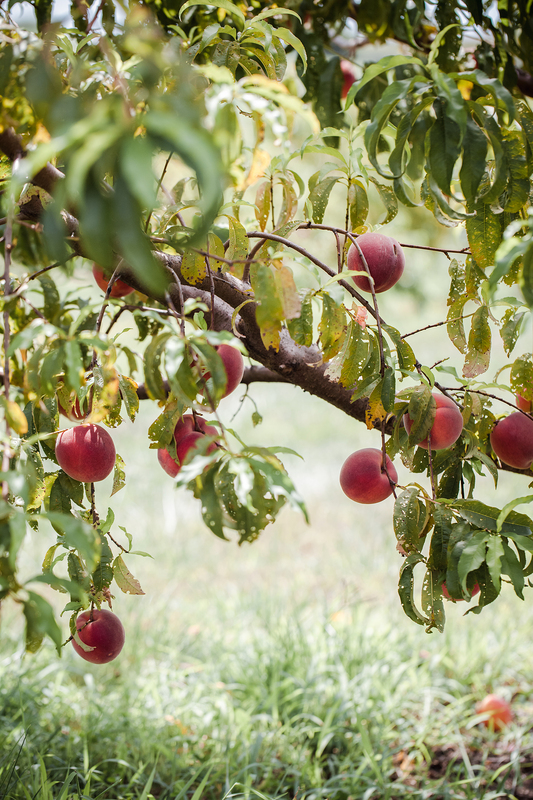 One of the first things I wanted to do when back at home was to visit a local peach orchard that I’d missed out on last year. 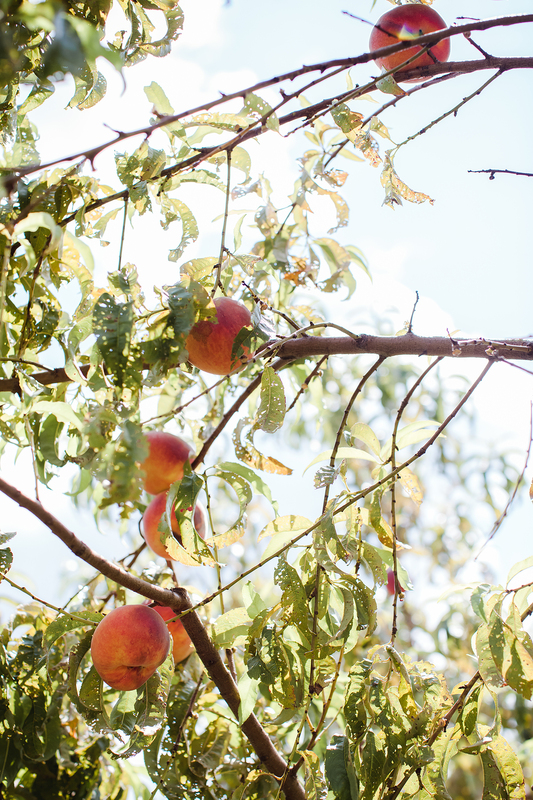 We nearly missed peach season again, but there were still a few trees producing and so we spent one late afternoon wandering in the quiet orchard. 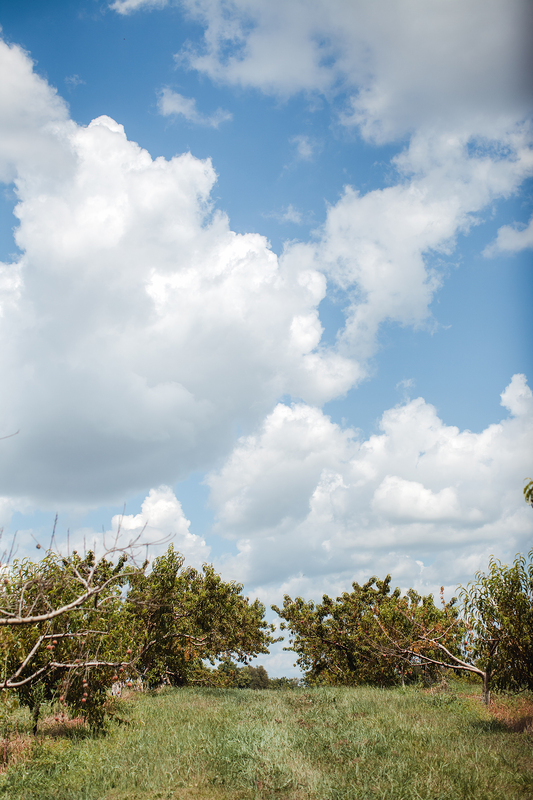 It was cathartic to let life be slow and unintentional; also super hot and humid- yikes August! It was a welcome distraction to think about what dessert to make with these peach beauties instead of thinking about the current events going on in this country and letting go of all the anxiety from this summer. If you ever need a space to feel free from the craziness that is this world, go spend some time in an orchard. Crazy world aside, my husband has been asking me to make a cheesecake for ages and after dinner with friends this past weekend (where they ordered a peach cheesecake) it seemed like now was the time. I have to admit that when it comes to peaches I love to just eat them with no alteration at all. They’re perfect as is and cooking them always seems to diminish their flavor to my palate; therefore, this Caramelized Peach Cheesecake is all about the simplicity of the glorious summer peach. Silky vanilla bean cheesecake that’s topped with caramelized peaches and served while they’re still warm. 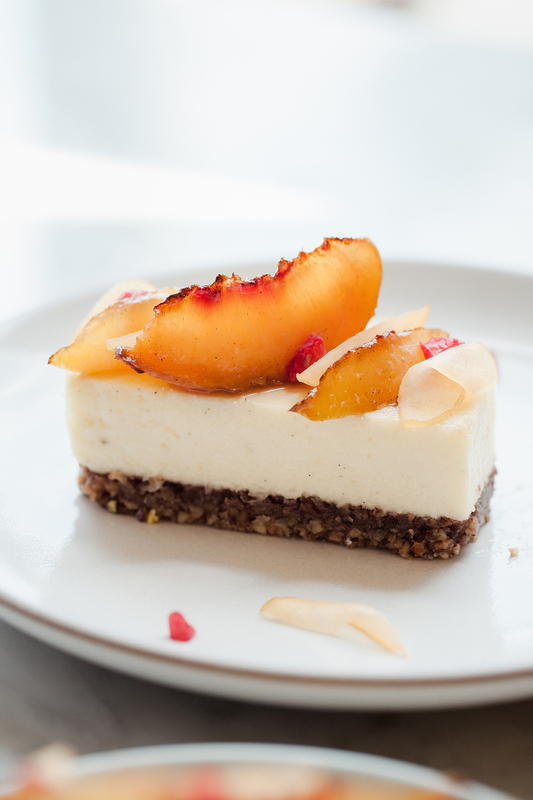 The contrast between the smooth and chilled cheesecake alongside the warm and crispy caramelized edges of the peaches is very satisfying. Not messing with the peaches too much allows their juicy ripe flavor to come through and maintains most of their texture as well. 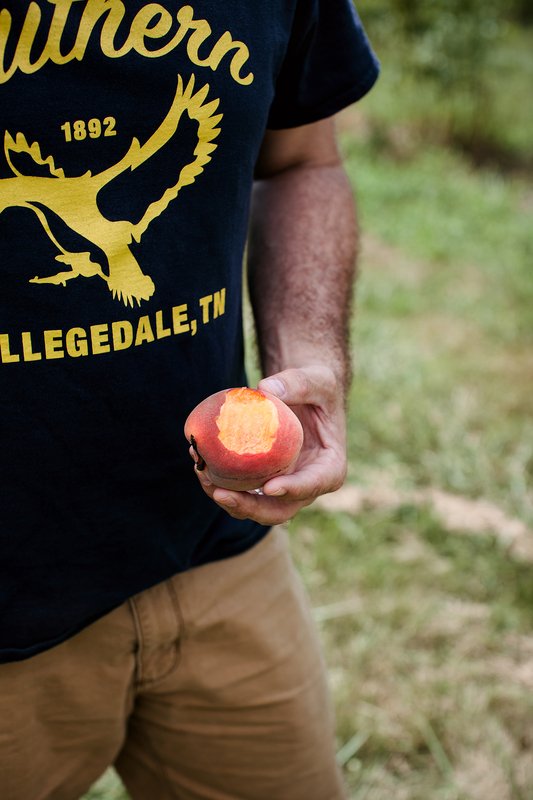 Enjoy peach season while you can. *This cheesecake is baked in an 8×8-inch square baking pan, but feel free to bake it in an 8-inch or 9-inch round pan if preferred. *Be sure to allow the cream cheese to come to room temperature before starting this recipe. Cold cream cheese, or even semi-cold, will leave behind lumps in the filling. Fully soft cream cheese creates a very silky and creamy final cheesecake. Setting it out on the kitchen counter the night before is recommended. *This recipe uses pecans for its base. If a pecan nut crust isn’t for you, simply swap out this portion of the recipe with a graham cracker base or substitute another nut variety (pistachios or hazelnuts would be good). Don’t skip toasting the nuts either as they have the best flavor. 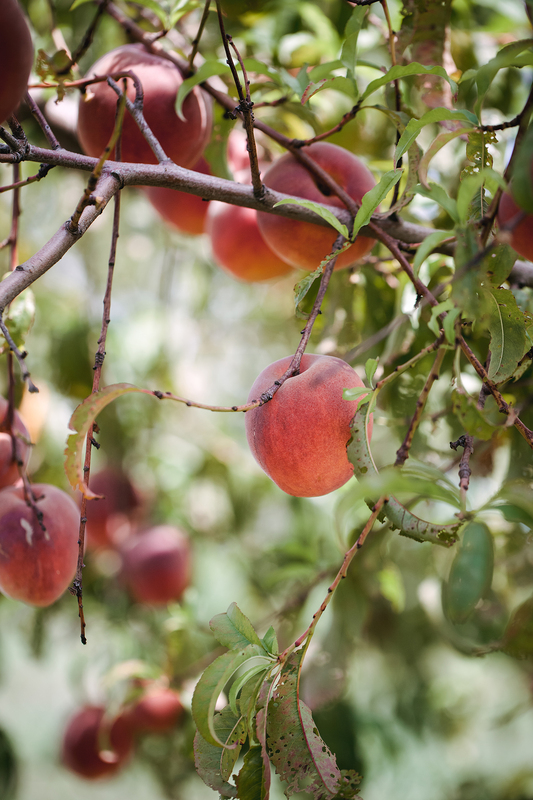 *Try and source the most fragrant and juicy peaches possible for caramelizing, such as at farmers markets. I tested this recipe using both peaches from a local orchard and from the grocery store and the difference was astounding. The orchard peaches became even more intense in flavor when caramelized, while the store bought peaches had hardly any flavor at all. Wherever you source them, taste-test before purchasing if possible. Preheat oven to 350F (177C). Line an 8×8 baking pan with parchment paper. Spread pecans into a single layer on a baking sheet and place into oven for 10-15 minutes until toasted and fragrant. Set on cooling rack until cool. In a food processor, add the toasted pecans, sugar and kosher salt. Pulse until pecans are finely ground. Add melted butter and pulse until combined. Transfer into prepared 8×8 baking pan and firmly press the nut crust evenly into the bottom of the pan. Place pan into the oven and bake for 18-20 minutes until crust is lightly golden. Remove from oven and let cool. Preheat the oven to 325F (165C). Place a kettle of water on to boil for the water bath. In the bowl of a stand mixer, fitted with the paddle attachment, beat the cream cheese for about 1-2 minutes until smooth. On low, add in the sugar and then increase speed to medium and beat for another 2 minutes until fluffy. Stop the mixer and scrape down the sides and bottom of bowl as needed. 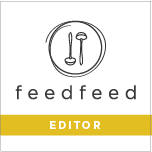 On low, add in the eggs one at a time (allow each egg to incorporate before adding the next) and stop to scrape down the bowl as needed until all eggs are combined. Add in heavy cream, sour cream, vanilla bean seeds, lemon zest, and squeeze of lemon juice. Mix, on medium speed, until combined. Pour cheesecake batter onto cooled nut crust. Set the unbaked cheesecake pan into a large roasting pan. Pour boiling water into the roasting pan until the water is about half way up the sides of the cheesecake pan. Carefully transfer to the oven and bake for 1 hour to 1 hour and 10 minutes or until cheesecake is just set in the center (jiggles slightly when bumped). Remove from oven and set on cooling rack to cool for 30 minutes. Remove cheesecake from water bath and continue to let cool on rack. Once cool, cover lightly and transfer to refrigerator to chill overnight. Using the parchment paper sides as handles, remove chilled cheesecake from baking pan and set on a cutting board. With a large chef knife trim the edges of the cheesecake (Tip: Rinse the knife blade off with hot water, and dry it, between each cut in order to achieve clean cuts.). Cut cheesecake into 3 1/2″ x 1 1/4″ rectangles by cutting the whole cheesecake in half vertically and then slicing each half into 1 1/4-inch slices horizontally. 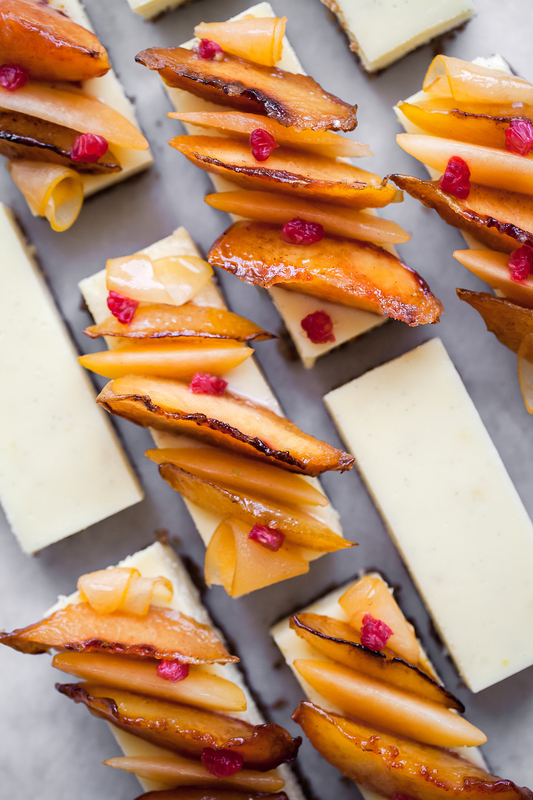 Top each chilled cheesecake slice with a few warm caramelized peach slices and serve immediately. Store any leftover cheesecake slices in the refrigerator, in an airtight container, for up to three days. *Reserve the scraped out vanilla bean pod for making vanilla bean sugar used for caramelizing peaches. To make vanilla bean sugar, simply fill an airtight container with 2 cups of sugar and bury the empty vanilla bean pod into the sugar. Place on the lid, shake it up, and let it sit indefinitely. Use as an equal substitute for regular sugar. On a cutting board, cut each peach into 1/2-inch slices (about 12 slices per peach). Place vanilla bean sugar in a bowl and coat (dip) both sides of each peach slice in sugar. Meanwhile, heat a large skillet over medium-high heat and add 1/2 Tbsp of butter. Add 12 peach slices into the pan, in a single layer, and let cook for about 1-2 minutes on each side until golden and caramelized. Gently transfer caramelized peaches to a parchment lined baking sheet and repeat with remaining peach slices until done. If needed, rinse and dry out the pan between batches if caramel starts to burn. This entry was posted in Cakes, Summer. Bookmark the permalink. The cheesecake looks delicious! Your recipe came on time, while I was wondering what to do with a couple of peaches that I have in the fridge. Was wondering though, how you managed to get a perfect cut for each cheesecake portion. Any tips about that? Thank you, Kris! In the cheesecake recipe portion above, there’s a tip provided on how to create clean cuts by rinsing your knife under hot water and then drying it off between each cut. This will give you nice clean and sharp edges. I try to share as many tips as possible (in the ‘helpful tips’ section before the recipe and also within the instructions) in order to make sure whoever is making these desserts can be successful, but always feel free to ask me questions too. Enjoy using up those leftover peaches! I love this recipe from you Teresa! I missed your posts and your blog update 🙂 So happy to see you back in this space. I love the pictures, and peaches are my fav stone fruit! Growing up the peaches were not good in India, so I did not like them. After trying the CA peaches, I am in love! I hope I can try this dessert soon! This is a stunning cheesecake. Love the clean cut wedges. I am not big fan of the no bake variety so I need to try a baked version. Hopefully I can get to it soon. Thank you, Jenny. Hope you enjoy it! If i mixed all the ingredient but not egg, would it be cold cheese cake? Interesting question, Feyza. The heavy cream and sour cream create a fairly fluid batter that requires baking to set properly, so I wouldn’t recommend it with this recipe.